The Dallas Cowboys are arguably one of the most popular teams in the NFL today with the huge fan base that can put enormous pressure on this team to succeed every week during the NFL regular season. 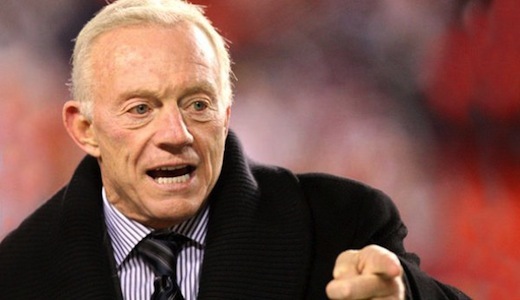 Not only do the Cowboys have one of the biggest fan bases in the league today, but they also have a very demanding and flamboyant owner in Jerry Jones who also puts enormous pressure on this team to succeed. Coming into this NFL regular season, the Dallas Cowboys were considered to be arguably the team to beat in the NFC Conference as they were one most talented teams on both sides of the football. Unfortunately, the Cowboys were doomed from the word go as nothing went right for this team despite seemingly having all the right pieces to the puzzle in place to make it to the Super Bowl and become the first team in the NFL to be playing in a Super Bowl that they were hosting. Along with consistently failing to live up to expectations week in and week out, the Cowboys have had their fair share of injury problems this season as perennial Pro Bowl quarterback Tony Romo went down with a broken collarbone (out for the season) and promising young rookie wide receiver Dez Bryant suffered a broken ankle (out for the season). Ironically enough though, it seems like the one thing that the Dallas Cowboys needed to turn things around was some drastic changes and a serious reality check. The biggest change the team made this season was firing head coach Wade Phillips and replacing him with Jason Garrett which has turned out to be a brilliant move. Even though this season has been over for a long time for the Dallas Cowboys, they have played pretty well under Jason Garrett and could be a very promising team next season, but they will look to finish this season out on a high note by trying to the best of Andy Reid’s Philadelphia Eagles in Week 17. Despite being arguably the most talented team on the offensive side of the football this season with MVP candidate Michael Vick under center, the Eagles will most likely be taking it easy in the final week of the NFL regular season as they have already won the NFC East division title and paved their way into the playoffs once again. With that being said, this could be a game in which the Dallas Cowboys dominate from start to finish as the Philadelphia Eagles already said that Michael Vick will most likely sit out this one. The only problem the Dallas Cowboys might have in this game is who they will have a quarterback after veteran Jon Kitna went down last week. Even with Kitna out though, I believe the Cowboys should be able to get the best of their division rivals this week and thus ending their disappointing season with a win.